Today we were going to the opticians in Larky. Scamp was going for an eye check and because she felt her contact lenses weren’t quite right. I was going because I thought I needed a new pair of reading glasses. My reason was that the legs had fallen off, the frame was broken and there was only one lens in the frame. Yes, I think I may need new specs. Thankfully, after inspecting my glasses, the optician agreed that it was probably time I had new glasses. Scamp also needed new lenses, but he also told her that she had the beginnings of a cataract and that although it would take about five years to mature, when it does and when she has the operation, she will be able to see perfectly for the first time ever without lenses or contacts! How amazing is that? After that revelation, we drove down Clydeside for a light lunch. We ended up at Sandyholm which is now the ubiquitous Dobbies. I hesitantly ordered a pot of peppermint tea for Scamp and, hesitantly, an Americano coffee for me. My record on coffees hasn’t been all that good recently, but I needn’t have worried. The coffee was fine. So was Scamp’s sandwich plus my panini was just as it should be soft and warm. If anyone was needing nails hammered in they’d need to use a hammer instead or go to Craigend Nursery to get an alternative impelling agent. We’d already bought a couple of plants from what looked like a new nursery further along the road, with the unusual name of “The Flower Fairies”. That isn’t the kind of name I’d expect from a plant nursery, certainly not down Clydeside. Still, we had a look at the plants on display at Sandyholm and as usual with a Dobbies franchise, they looked a little worse for wear. Admittedly the weather has been unusually hot these past weeks, but that’s no excuse for not watering the plants you’re hoping to sell. Drove home through Netherburn. The houses in the scheme had been tarted up, but the occupants still had those low brows and stared in suspicion at a red Juke driving round. You could almost see the brain cells working “That’s a STRANGER”. Drove out in the direction of Craignethan Castle and were surprised at the amount of new houses being built on what used to be the railway. Noted that the primary school was gone leaving only the iron railings. It’s amazing the changes in a place after thirty odd years. Back home Scamp finished pulling the fruit from the blackcurrant bush and then started pruning it back. I finally watered the Vine Weevil nematodes into anything that looked like it needed it and then finished off with a feed of seaweed fertiliser. Spoke to JIC tonight and exchanged views on our holidays. Ours was totally different from theirs, but both lots seemed to be satisfactory. 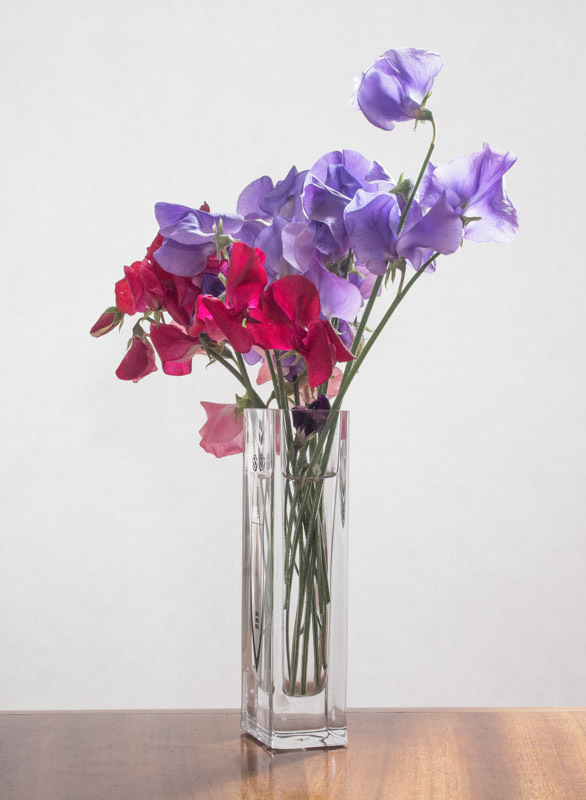 Today’s PoD is Scamp’s sweet peas, the second picking. Out early tomorrow to see the physio and no ballroom dancing in the afternoon as it was cancelled by Michael. Maybe, just maybe going to salsa at night.